If Frank can do it at 82 then what the hell is up with you? Bill Cummings wrote: If Frank can do it at 82 then what the hell is up with you? Here's Frank with no hands this past Monday ... at 82!!! It's hard to put it into words, but I'll do my best. At a small sand dune - one of the sites where hang gliding began in the early 1970s - the US Hawks have secured the right for a number of US citizens to transit the airspace (at low altitude). These citizens do not need to belong to a Hang Gliding "Insurance" company in order to do this. Among these citizens are HG pilots who were among the first to fly modern hang gliders. Back in the early 1970s these pilots did not need "site insurance" they just flew - low and slow! The Dockweiler dune is a small hill but it is MUCH larger, symbolically. Critics of the US Hawks (i.e. friends of the U$hPA) can trivialize our accomplishments at Dockweiler but doing so is a form of denial. Picture a large bird with it's head stuck in the sand. One or two big liability claims against the U$hPA's RRG and that large bird will become flightless. Odd resemblance to the U$hPA? wingspan33 wrote: It's hard to put it into words, but I'll do my best. Your best is pretty good. In my opinion, this was one of your all-time best posts. wingspan33 wrote: The Dockweiler dune is a small hill but it is MUCH larger, symbolically. Absolutely correct, and very well said. wingspan33 wrote: Critics of the US Hawks (i.e. friends of the U$hPA) can trivialize our accomplishments at Dockweiler but doing so is a form of denial. Picture a large bird with it's head stuck in the sand. One or two big liability claims against the U$hPA's RRG and that large bird will become flightless. Again, right on target. USHPA has created an artificial dependency on their own mismanaged insurance monopoly. 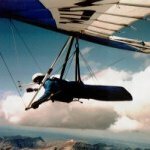 They portray their RRG as the only way to save hang gliding because they want desperately to hang on to that monopoly. The U.S. Hawks recent work at Dockweiler exposes USHPA's scam for what it is - a lie. Thanks Scott. That was a super post.